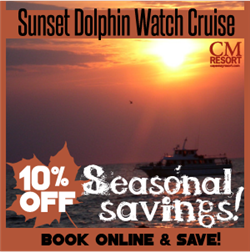 An Evening Trip Around Cape May to Search for Dolphins and the Sunset- End your day with a relaxing cruise around Cape Island. Search for bottle-nose dolphins and enjoy the day end sunset and twilight over the Atlantic Ocean and the Delaware Bay. Our trip is scheduled to catch the best of the evening light as the sun sets and we also provide historic commentary from your naturalist/captain to add to your trip enjoyment. You can enjoy a cold or hot beverage from the ship's snack bar, including cold beer or wine are available during your trip. We also include all you can eat Pizza and Hot Dogs with a regular ticket and the snack bar is open during the entire trip. Please ask about our Buffet Upgrade before you reserve or you can purchase your upgraded tickets below with a 10% discount. Free Pizza and Hot Dogs are served throughout the cruise. Encounter local dolphins in their pristine environment and learn about their habitat. Learn local history from out Captain as he narrates the tour with historical facts. See the Historic Cape May Lighthouse and enjoy Victorian Homes from an Ocean View. A unique look at America's oldest seashore resort and 'National Historic Landmark' - On your way around the island enjoy commentary on over 20 historic sites. Points of interest include the Cape May Canal, Delaware Bay, the Concrete Ship 'SS Atlantus', Cape May Point, Cape May Lighthouse, the Victorian Cape May beachfront, Cape May Harbor, USCG Training Center, and Fisherman's Wharf. History commentary was developed with the 'Mid-Atlantic Center for the Arts' (MAC), Cape May's leading history organization. MAC operates the Emlen Physic Estate, Cape May Lighthouse, and Cape May Trolley & Walking Tours. Have a Complementary Pizza and Hot Dogs on Us -Enjoy a complementary hot dog or slice of pizza fresh from Tony's Pizza, Cape May's favorite pizzeria. These treats are available during most of the trip! Cold soda, bottled water, hot chocolate and coffee, or cold beer, wine and mixed drinks along with snacks, candy, ice cream, hats, postcards, t-shirts and sweatshirts are all available. Sightings Guaranteed-If marine mammals are not sighted on your trip you are invited back free for another trip of your choice. The Free Pass never expires, which is a Cape May Whale Watcher exclusive! Guarantee applies to paid CMWW red ticket holders. Marine mammals include dolphins OR whales OR porpoises. Your Simple Tix order is for (1) Cape May Whale Watcher Excursion, please select the date required below, or search the calendar to purchase your tickets in advance. Don't forget to Save 10% with promo code: CAPE MAY RESORT at check out. Sorry you cannot order tickets for this event at this time. English (United States) (EN) | (c) 2013 Cape May Resort. All rights reserved. It looks like your cookies have disabled on your browser, this store requires cookies, please adjust your browser's settings to enable cookies to continue.